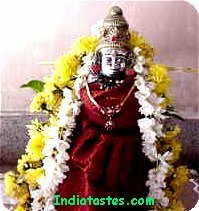 This pooja falls on dwadasi as well as Friday in the month of Aadi or Aavani(Tamil month), the day in which goddess Lakshmi was born from the sea(paar kadal). Varalakshmi is the Goddess of all wealth and gives us whatever we want(varam means boon). To get the blessing of Lakshmi, we perform this pooja with great care and devotion. This pooja is celebrated in a grand manner. On the previous day(Thursday), we clean the pooja room, do floral decorationsand kolam with rice flour and make arrangements for the pooja. After cleaning the sombu(kalasam), put some coins, betel, betel nut, turmeric, lemon, comb, mirror, black bangles(very small), black beads, raw rice, kunguma chimizh(very small one) etc inside it. Arrange the mango leaves over this and keep a coconut on top, Fix the amman face on the coconut, then decorate the kalasam. Place some flowers. Keep the sombu in the pooja, prepare ven pongal for neivedhyam. take karpoora aarathi. This pooja must be done with utmost dedication.To start the pooja, keep the goddess near the entrance of the house on the kolam(inside the house). Keep flowers. Then take karpoora aarathi. Then bring the deity to the pooja place singing the song “Lakshmi Raave maa inti ki” which means “Lakshmi please come to our house”. In the mandha haasam, place a plaintain leaf and spread raw rice. Keep the kalasam on this and decorate the deity. Keep the nombu saradu(yellow thread) also.